Rising Voices note: This article is republished here as a collaboration with Indigenous Tweets. Read the original post here. The Indigenous Tweets project is still going strong, and the number of languages we're tracking on Twitter continues to grow – we added the 138th and 139th languages (Inari and South Saami) to the site a couple of weeks ago. Last week, the team at Twitter was nice enough to feature Indigenous Tweets on their “Twitter Stories” site; you can read that piece here. “Right now, we're unable to support more languages in GIYL”. We haven't been able to reach anyone at Facebook about this, but we've heard second-hand that they have had problems with spam translations and poor quality from some of the smaller translation teams. Whatever the reason, there are hundreds of language groups out there actively using Facebook to communicate in their language, but who are forced to use the site in English, Spanish, etc. This flies in the face of Facebook's stated aim to “make Facebook available in every language across the world”. To solve this problem for his own language of Secwepemctsín, the late Neskie Manuel came up with a clever solution using a technology called Greasemonkey. His code acts as a kind of “overlay” that runs in your web browser; as you navigate pages on Facebook, they are sent across the network to you in English, but then can be translated on the fly in your browser. Personally, I think it's a bigger, more important idea than that. What it means is that any language group can undertake a translation without having to wait for Facebook's approval or permission, and the same approach works in theory for Google or other popular web sites that aren't open to translation. I've been working on open source software translations for more than ten years, and have contributed to the Irish translations of Mozilla Firefox, LibreOffice, KDE, etc. I've strongly advocated [PDF] for an open source approach among indigenous language groups who are just starting out on software translation, because it means that the community itself can maintain control and ownership of their work, instead of having to rely on the goodwill of a big, for-profit corporation. The trouble we're facing now, however, is that more and more of the software we use is “software as a service”: Gmail instead of Mozilla Thunderbird, Google Docs instead of LibreOffice, etc., or social media sites like Twitter and Facebook. This trend puts control of the online “linguistic landscape” firmly back in the hands of big corporations. Neskie's approach gives us a way to maintain a measure of control over the language we choose to use online. Doing a “complete” translation is quite easy. Depending on how much terminology you have to make up, it can take as little as a couple of hours of work. I've picked out around 200 of the most common messages that appear on Facebook to be translated. Of course this is only a small fraction of the entire site (which would be overwhelmingly large for a small language group to undertake), but by choosing these 200 messages carefully, we're able to achieve a convincing immersive experience in the target language with a minimum of effort. There are a few technical terms needing translation (e.g. “Mobile Uploads”, “email address”, “Apps”, “Cookies”), some site-specific jargon (“to like/unlike”, “to poke someone”, “status update”), and western concepts that have been difficult to render in some indigenous languages (“Privacy”, “Advertising”). A useful technique for terminology creation is to see how other languages have dealt with a given concept. To help with this, I've asked everyone who has contributed a new Facebook translation to also provide “back translations” of some of these tricky terms into English, in the hope that some of these might be helpful to new translators. These back translations are stored on the project wiki, and we welcome additional contributions in any language. I should also say that you don't need to translate all 200 messages if you don't want to. For a language that is rarely, if ever, seen on the computer, I think there's great symbolic value in even a translation of just a few key words, for example “Like”, “Unlike”, “Comment”, and “Share”. I would like to receive instructions. I’ve got the link to the spreadsheet for translations if you can email me your contact info. navajonowblog@gmail.com, krystle@navajonow.com It’s about half done. I’ve got a google doc setup. We are about half way done. If you’d like to help translate Facebook email me at navajonowblog@gmail.com or krystle@navajonow.com with some contact info. We sure could use the help. How do you translate Norwegian facebook posts to english? 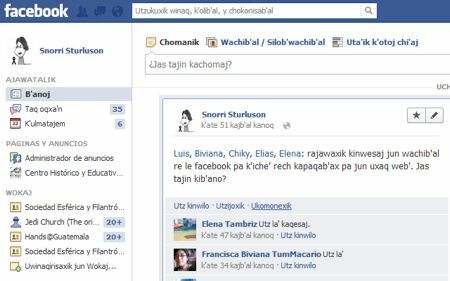 I think it is a great initiative to translate Facebook into minority languages.